Fired Kenya Sevens head coach Innocent Simiyu has been reinstated. 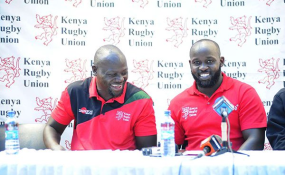 Simiyu, who was fired on Thursday last week, has been restored following a meeting between Sports Cabinet Secretary Rashid Echesa and Kenya Rugby Union (KRU) board led by vice chairman Thomas Opiyo on Monday. Echesa said in a statement Monday that besides reinstating Simiyu, his ministry will work with the Union to ensure pending arrears are paid. Echsa explained that the ministry and the board also agreed that their goal is to see successful national rugby teams and that they will go extra miles to ensure this is a reality. The Union on Thursday sacked Simiyu just hours after Tourism Cabinet Secretary Najib Balala revealed that he had instructed Brand Kenya to cancel its eight-month Sh20million partnership with Kenya Rugby Union. The Union said that they had mutually parted ways with Simiyu effective immediately after the coach took full responsibility for the display that saw the playing unit blank out Brand Kenya's branding in Paris Sevens, which negatively impacted our country and sponsor's image. The CS said the move was informed by Kenya Sevens players' decision to conceal the branding of their shirt sponsor, Brand Kenya, during the Paris Sevens leg of the World Rugby Series on the weekend of June 9 and 10. Shujaa playing with Brand Kenya's "Make It Kenya" message in front of their jerseys, concealed the message during all their matches at the Jean-Bouin Stadium in protest over a payment dispute between themselves, Kenya Rugby Union (KRU) and team sponsor Brand Kenya.